This weekly four-part series serves as a guide to blockchain for trade finance. Fluent Network’s founders Lamar Wilson and Casey Lawlor provide GTR readers an overview of how blockchain technology provides transparency, streamlines asset transfer and lowers the operating costs of global trade finance programmes for all relevant parties. Follow the links for Part 1, Part 2, and Part 4. In our last article, we talked about connecting parties to decrease operating costs and creating a framework for automation in trade finance. Equally important is the reduction of risk that comes from connecting traditionally siloed parties on a distributed database and including information about invoices, approvals and previous financing transactions to lenders. Sharing and verifying information amongst participants in trade finance can drastically reduce opportunities for fraud. For example, duplicate invoices can be detected much faster and the malicious parties responsible can be easily identified and reported to the network across a blockchain platform. 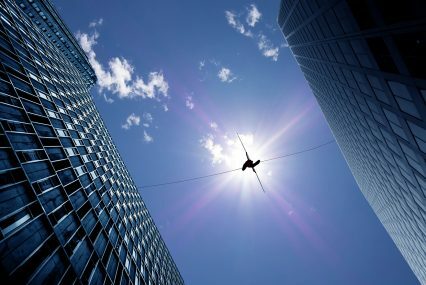 One large risk factor in trade finance is the title and transaction risk on receivables, ie, that a receivable you are purchasing may be owned, partially owned, may have liens on the receivables or represent collateral in another transaction, or have been previously sold to another lender. In any of these cases, the purchase of the receivables by the lender may be invalid, and they may have to go into arbitration to figure out who legally has the rights to collect payment on those receivables (or collect on a default, for example). While data on fraud rates is murky, as banks have a large incentive to keep these incidents quiet, the stakes are high. Several of the largest global banks have all fallen prey to invoice fraud in the past decade, incurring hundreds of millions of dollars in losses per incident. On a blockchain-based network, after the perfection of an invoice has occurred by the first purchaser, other funders can view the ownership of that invoice and cannot purchase it a second time, regardless of geographic location. The ability to confirm that this has occurred not only prevent double-financing but can also streamline the transfer of the asset. The receivable on the network can be represented as a unique digital asset (tokenised) such that ownership could be proven, and transfer of title would be real-time and peer-to-peer. In this case, no other party on the network could claim ownership across different jurisdictions without cryptographic proof of title of the receivables. They would also be the only party with the ability to transfer ownership of this asset to other parties. Also, financial institutions OUTSIDE of the network would be weary of financing a receivable of a supplier WITHIN the network without first checking the ownership status of that particular receivable with participating financial institutions first. This could enable banks on the network to implement an originate-and-distribute model for trade finance assets without costly arbitration and significant operating costs associated with due diligence, asset transfer and reconciliation. Taking this a step further, once adoption of a lender network for receivables has gotten large enough and includes the top financial institutions and trade finance programmes, the title ownership and transfer risks for lenders that are a part of the network would drop to almost zero. This tokenisation, or creation of a digital asset incorporating legal frameworks, could create a new standard entirely for trade finance. The incentives to join the network would only increase as receivables outside the network would be deemed riskier. Discount rates would increase for out of network receivables, and suppliers’ adoption of the globally networked solution would skyrocket. A network such as this would also discourage malicious actors from participating. Historical data across the network would derisk suppliers and trade finance transactions even further and be used to create trust ratings, although we will touch on this more in part 4. Additionally, if the trade financing model used is reverse factoring, the financial institution can reduce risk one step further. In this case, the buyer of goods can sign a digital approval of the invoice using a private key once they have received satisfactory goods or services. Effectively, this creates a promise to pay and a timestamped record of approval down to the user level. The funder can then be absolutely sure of the invoice approval. Once signed, the unique digital asset can be financed at the credit rating of the buyer, providing much lower cost of capital for their supplier. Additionally, in the future, the payment could be included as part of a smart contract to automatically execute at the date on the invoice and be sent directly to the funder (or funders). Across the above examples, the traditional due diligence process to reduce risk has been replaced by an elegant digital solution, verified by cryptography and distributed among all necessary parties on the network. Technology and the distribution of information across the network eliminate paper, phone calls and manual entry that leave holes and create room for ambiguity. By connecting these siloed parties across jurisdictions and creating unique, tokenised digital assets to represent receivables on a distributed network, you can improve transparency and reduce risk while simultaneously decreasing the cost related to due diligence. While this will require buy-in from large international financial institutions, it is absolutely in their best interest to do so. While many refuse to report the real numbers, fraud is a reality for almost every financial institution that participates in trade finance programmes. As the network grows these benefits will be realised, and soon digital industry standards can develop out of it. It is through this standardization and digitisation of these processes, related documents and legal structures where we will see massive increases in efficiencies. This will also make it much easier to provide financing to SMEs who are underserved and represent a large blue ocean in trade finance. In the future we could see these standards and risk reduction methods allowing a more diverse pool of participants in trade finance, improving the utilisation of capital, and increasing the efficiency of our global economy.